Used for work. Nice sizing and great price. 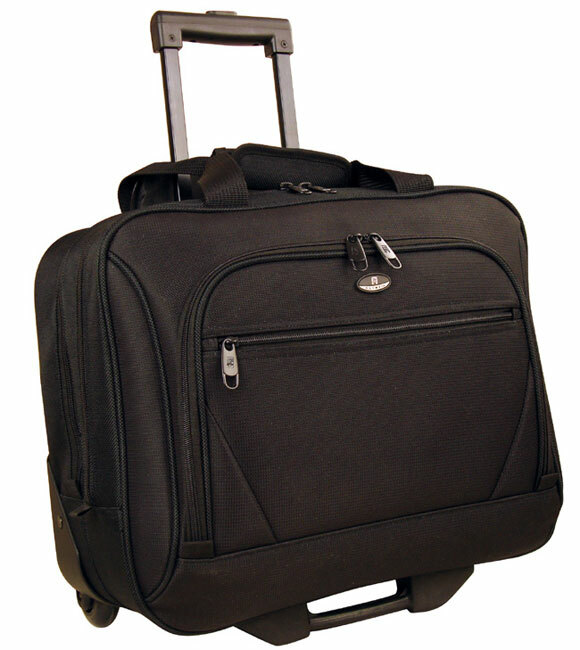 Keep your laptop with you on the plane by using this Olympia deluxe 14.5-inch rolling laptop carry-on tote bag. 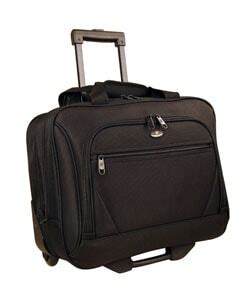 Metal ball-bearing in-line skate wheels let you roll this bag right through customs without having to juggle it with your other luggage, and the heavily padded interior stores your laptop securely. An EVA foam front panel adds extra protection. Organize your materials using the zippered front pockets, or store them with the laptop in the second compartment on the inside. A push-button locking internal retractable handle lets you easily switch from rolling the bag to carrying it by hand. This product is really great. I haven't had any problems with the wheels or any of the zippers. The material is durable. I would have given this a solid 5 star rating, but it doesn't have the padding some of the higher priced briefcases have to protect laptops. I don't travel that much with mine, so it should be fine, plus I have a laptop sleeve that will give extra protection when traveling. If you are not careful, you could possibly damage a laptop when traveling with this bag. It also has enough compartments to hold all of your personal items so that is a great plus. This is a GREAT value and a great buy. I recommend it. I used this product an average of 2 -3 times a week when I worked in the office. I work on a large campus and I usually have to transport my laptop from the parking deck to my office and sometimes between buildings for meetings. I enjoyed this product for the first three months and then the fabric that separated two compartments came apart. Later, the bottom of the bag between the wheels began to unravel. I guess that came from it touching the ground as you were rolling it along. This product was useful to me for about six months, before I decided to go back to the shoulder bag that I use for my laptop. The search is on for my replacement rolling laptop bag. Well, for the brand name I had hopes of a better quality briefcase. I use it primarily to carry college textbooks and my 17" laptop on occasion. I need to note it's not made for a 17" laptop but it fits in the rear compartment. You just have to be careful abut bumps up over curbs. It did not have the typical inside zipper portion where the smaller laptop officially goes. The fabric began fraying soon after I bought it and I haven't really had it more than a few weeks. It's just a matter of a few more weeks of use before the seam opens on the bottom because it was not reinforced with a plastic overlay which the better cases have. The inside lining is cheap. If the bag had not been advertised as "deluxe", then I would not have minded so much, but the manufacturers apparently don't understand what "deluxe" is! The handle height is good and the wheels so far. I am glad that I purchased the extended warranty because it looks like it will get used within six months' time. Sad but true! No more Olympias for me! This bag was a replacement bag for an older version of the Olympia Deluxe Rolling Bag. This bag loses some of the weight from the older models by foregoing the hardsided backside. This is not a problem for protection of your laptop. The zippers work well and the constuction is designed for wear and tear. The wheels roll well and are protected when you go up stairs if you need to drag them up. This is a nice tote, it rolls nicely and holds a lot of my things. The only issue is the handle does not easily retract back down. I have a lot of items that I need to carry back & forth between home & work. This case has been GREAT! Since I do not have a laptop I put an accordion pocket folder inside that so that I could keep my papers organized and easier to find at either destination. There is even room for my lunch and it stays cold! the front pocket is handy for all my writing essentials too.I have enjoyed having it and my sholder does too since my old bag was a big bag I had to carry all over the place, I feel more put together now, thank you. This roller was inexpensive but is quality. It's been all over Eastern Europe and now London, off and on planes boats planes taxis trolleys funiculars without the slightest problem. It's light, easy to manoeuver, compact enough to fit under a plane seat and can function as a rolling briefcase with pockets and compartments for laptop etc but with an added compartment for overnight clothes and toiletries and small front pockets for passport, pills, liquids and gels. In fact it's astonishing how much you can actually cram into it. Yesterday we went to see the new granddaughter , laden with presents, but we got them all in and rolled there. The Zips are very strong by the way. I' m very impressed and by the way delivery was swift. this bag lasted me less then 6 months. the bottom of the bag that you rely on to hold the bag in a verticle position when sitting on the floor has failed. the result is that the bag can not sit flat on the floor with out falling over. Very frustrating because I have not absued this bag by travel, just to work and back in my car. The size is perfect but the bag is very wobbly. Not steady. It moves in all directions and the handle is not strong at all. At some point the handle drops. Very amateur built. I took it to a very high tech professional event and felt very embarrassed. I regret for buying, penny wise pound foolish. I should have spent more and get a better one. I bought the insurance (replacement policy for 2 years), hope that will be of use down the road. In the last 11 months I have had two of these and the wheels fell apart on both. I purchased one and returned it when the wheels fell apart. Now the wheels have disintegrated on the replacement one. I love the bag itself. It has plenty of room, well padded, and has held up well. I liked that the handle was long enough for me at 5'10. It doesn't do much good though when the wheels are useless. I use it everyday just to go in to work in the morning and come home at the end of the day. We have a large parking lot at work but I didn't think I walked that far. Perfect size bag, but wheels wore down really quickly. Only lasted a year. This rolling office turned out to be a life safer for my shoulder. It's wide and roomy. It's pretty sturdy, and rotates on its wheel. One complaint, the file holders do not stay in place so i don't hang my files. I do love the bag. You won't regret this purchase! to wide to roll down the plane ilse. u have to pick it up carry it sideways. if it had 4 wheels on the bottom it would worked great. Great bag for a quick business trip. Holds my laptop, toiletries and enough clothes for an overnight trip. Very convenient and allows me to avoid checking a bag. I've received many compliments, no longer the bag lady at work, and my back hurts less & less everyday! Great size not to big , and not to small. I used this case daily for three years and it's still going strong! One issue...the area between the wheels seems to contact the ground often so it started to fray within a month of purchase. Otherwise its roomy and easily accessible. Great for back & forth to work. bought due to reviews and size, price. "How soon will this be back in stock?" Items are restocked as they become available. However, we cannot guarantee an item will be restocked. Please feel free to check back with us periodically to see if the item has returned. "Does this come with an adjustable shoulder strap?" No, the case does not come with an adjustable shoulder strap, just the carrying handles as shown in the image. Airlines have strict rules about luggage weights and sizes, so it's important know the restrictions of the airline you're using to avoid delays and fees when traveling. These tips will help you choose the perfect luggage for your travel adventures. Make your next adventure as stress-free as possible by choosing the best lightweight suitcase to meet your needs. Check out these tips for choosing your lightweight suitcases. Our handy guide will point you in the right direction for finding luggage and accessories that will be most useful on your next cruise.